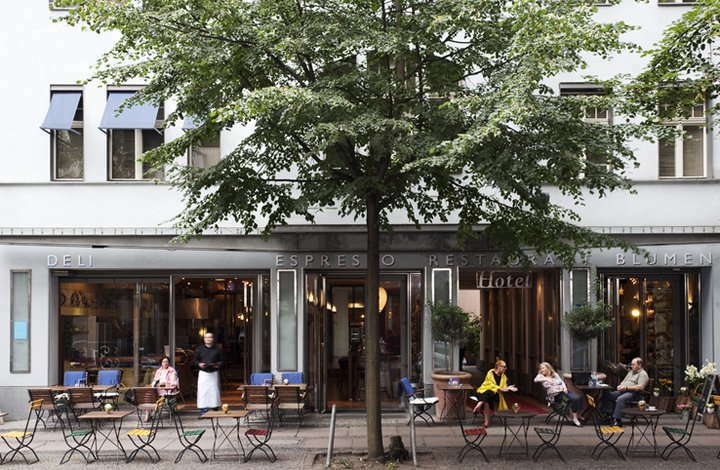 Opened in 1995, Berlin's first design hotel is relatively unassuming, with simple and serene rooms decorated with untreated oak, polished stone, and neutral shades. The eye candy lies in the terracotta-tiled courtyard, where you can sip drinks and enjoy sushi and Asian fusion cuisine served by the trendy restaurant, Dudu, at a 23-foot-long table, which is covered in shiny blue ceramic shards and rests on a bed of glass pebbles. A tall chestnut tree lends shade. 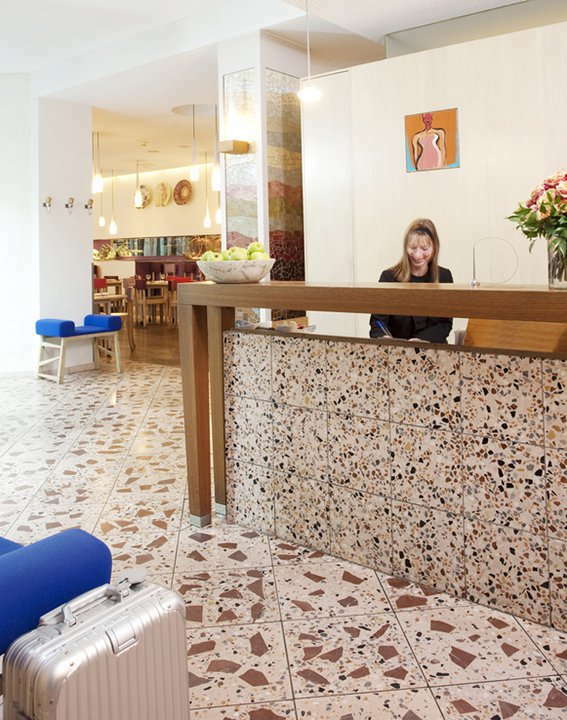 To reinvigorate after shopping at the nearby Ku'damm boutiques, help yourself to the free items in your mini-refrigerator or slip into the herbal steam bath inside the small wellness center. 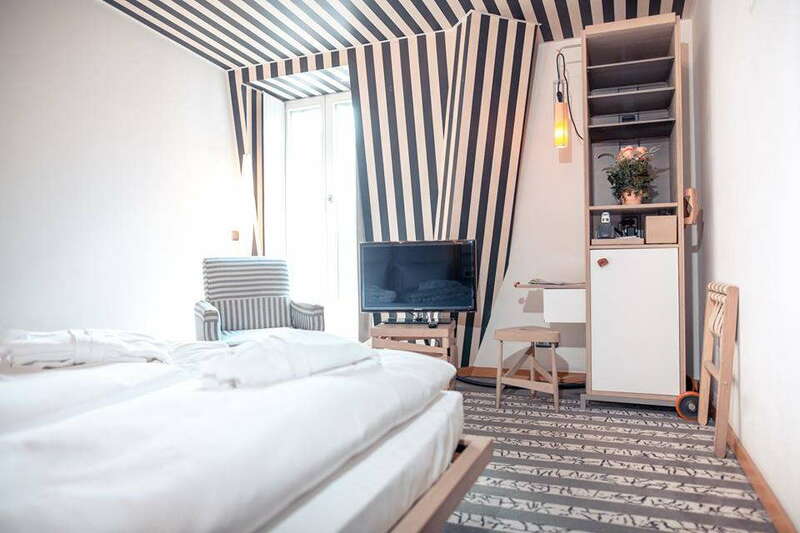 The rooms feature stylish, minimalist décor, with bold striped furnishings and lots of blond wood. Business rooms are quite small, with single or double beds, while the superior rooms are somewhat larger and have a kettle with a small selection of tea and coffee (provided). Some rooms have balconies and there are free non-alcoholic drinks in all mini-bars. Most bathrooms are on the small side; depending on the room, they come with a bathtub or shower. There’s a small lobby with a reception desk but the real hangout spot is the courtyard terrace with mosaic tables and colorful seating. The small spa has an herbal steam bath, and offers massage, reflexology and acupuncture treatments. Dudu, frequented by locals, serves excellent sushi and Asian fusion cuisine. 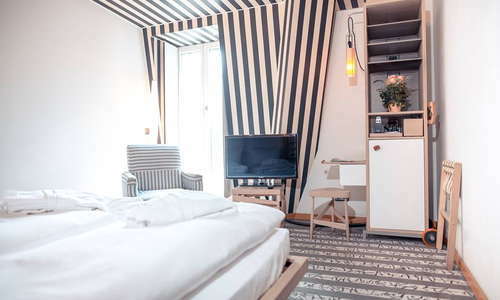 The shopping boulevard Ku’damm is around the corner, and the U-Bahn Uhlandstrasse and the Savignyplatz S-Bahn are both about a 10-minute walk from the hotel. Check out the huge gourmet food court at the posh department store KaDeWe (20-minute walk) for everything from steak frites to wiener schnitzel to pasta. Engelbecken (30-minute walk) serves upscale Bavarian and Alpine cuisine in a lovely location facing the park on Lake Lietzensee. 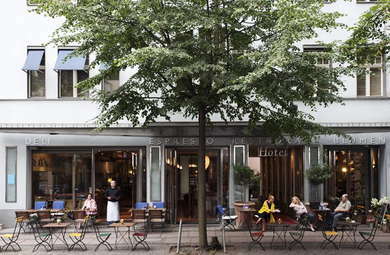 On leafy Savignyplatz, the Hefner Bar (11-minute walk) offers an extensive cocktail list and plenty of space to lounge. Nearby, tucked into the S-Bahn arch at station Savignyplatz, is Journey into the Night (7-minute walk), with upscale craft cocktails served in a hip, taxidermy-filled space. 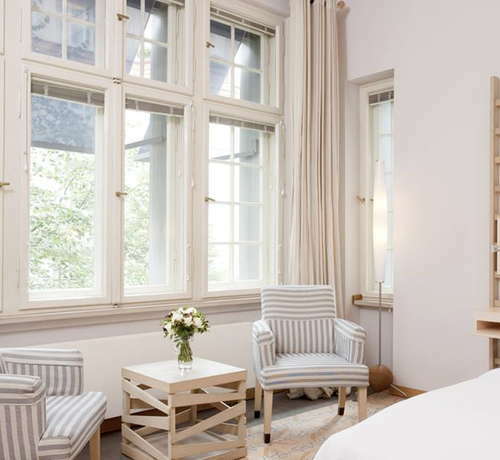 This intimate boutique property is set on a beautiful, quiet side street but is close to bustling Ku’damm and its numerous shopping and dining options. Its warm, welcoming service, pleasant interiors and pretty courtyard are plusses, while the wellness center, replete with herbal steam bath, is ideal after a long day of sightseeing.